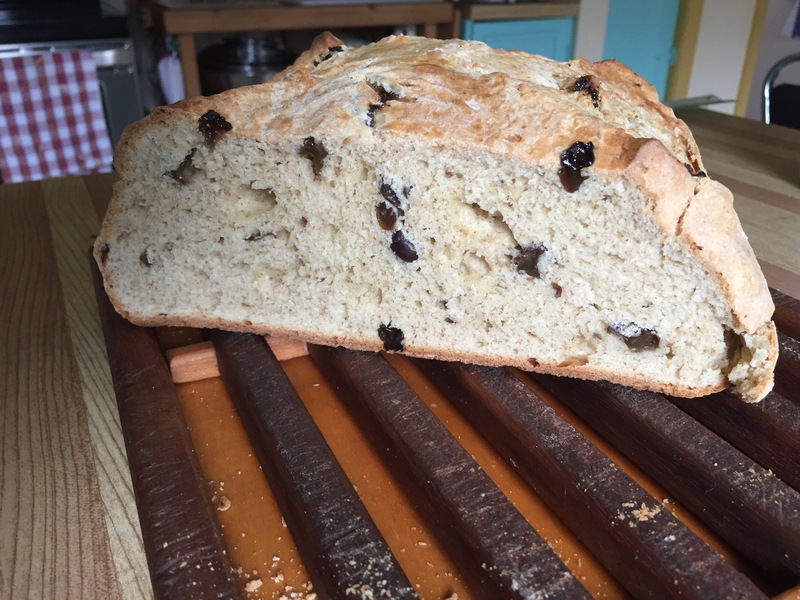 This is a simple recipe for a quick bread. You can make 2 loaves and freeze one if you wish. You can make one with raisins, good for breakfast, and another for dinner without raisins. It’s delicious fresh – just addictive. Preheat oven to 375F /190C. Put dough on well-floured surface and knead until elastic (it will bounce back when pressed down, and is no longer sticking to your hands.) Tuck bottom edges under and create a round “boule” loaf. Place loaf on a greased baking sheet or silicone mat on a baking sheet. Score the top with a sharp knife, making an X. Bake for approximately 40-50 minutes. Loaf is cooked when a cake tester (or a piece of spaghetti) stuck in the middle comes out dry. Let cool on baking tray for 30 minutes, then put on a wire rack. Store in an airtight bag or container, or freeze.